Lake Windermere, England's largest lake. Much as I love the idea of travel, the reality is often fraught with discomfort. For starters, no bed is as comfortable as our bed. No pillow fits my head like my pillow. No bathtub is as accommodating as our amply proportioned tub. And then there is the whole “getting there” part of travel. We don’t fly unless it’s an emergency, strictly business, or there’s absolutely no other way of getting there. This leaves plenty of options, the car being my favourite, followed by ships, ferries and trains. Road trips come with the most freedom and responsibility. Alas, they are more fun in countries with room to roam, like America. In the UK, I often feel as pinched for space on the motorway as I do on the back roads of Somerset (where Richard always drives) Still, the car remains my favourite form of transportation by a long shot. Not only can we go where we want, when we want, we can load the car to the max with several suitcases, picnic hampers, cases of bottled water and wine, Nordic poles (rarely used because Richard finds them embarrassing) books, hats, and my Spanish shopping trolley, for impulse stops at farm shops. Headed to mum and dad's, on the rugged Oregon Coast. Sequoia SUV and drove to Oregon to pick up my parents, then drove 900 miles to San Diego to catch a cruise ship to Mexico. 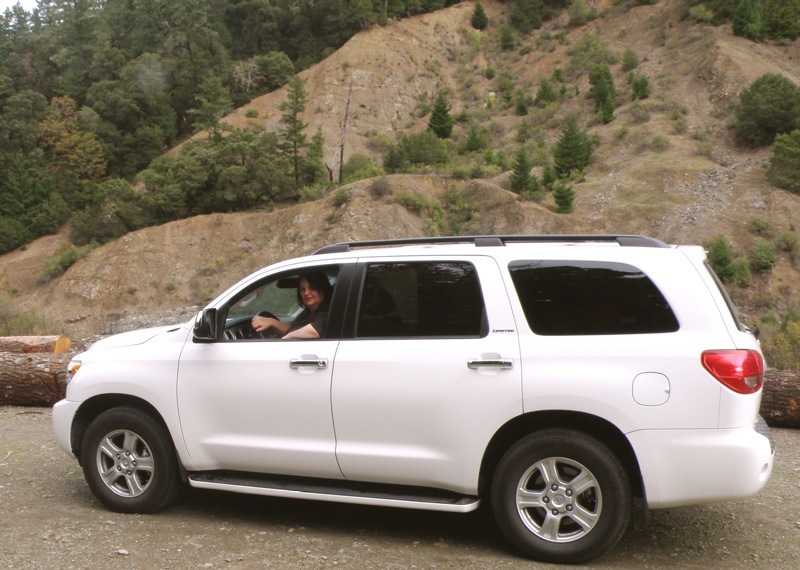 By the time we headed back to the UK, several weeks later, we had travelled over 6,000 miles by car, through giant redwood forests and a harrowing blizzard, along the cliffs of the Pacific Ocean, through San Francisco, Los Angeles, San Diego, Sacramento, and Medford. Other than the white knuckle blizzard drive, and a few notorious LA freeways, I loved every minute of it. 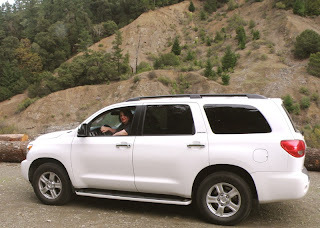 Of course, it helps tremendously that Richard is the world’s best navigator, in any country. One of the challenges of living the immigrant life, is that we tend to spend all our holiday time (and money) returning to the place I’m from, rather than discovering the fascinating place we live. In an effort to change this, we have, in the past year, explored Devon, Somerset, East Sussex, Manchester, Scotland, Northern Ireland, the Irish Republic, and this week Cumbria’s Lake District. We fell so hard for Devon that we made a serious attempt to move there last winter. Driving through Exmoor National Park, with wild ponies and rams grazing above the sea, I was moved to tears by the astonishing natural beauty surrounding us. Manchester is home to my favourite art museum (in the world). Northern Scotland reminded me so much of Northern California I was homesick for days. And the Lake District, looks like Lake Tahoe, with lots of little lakes, instead of a single huge lake. 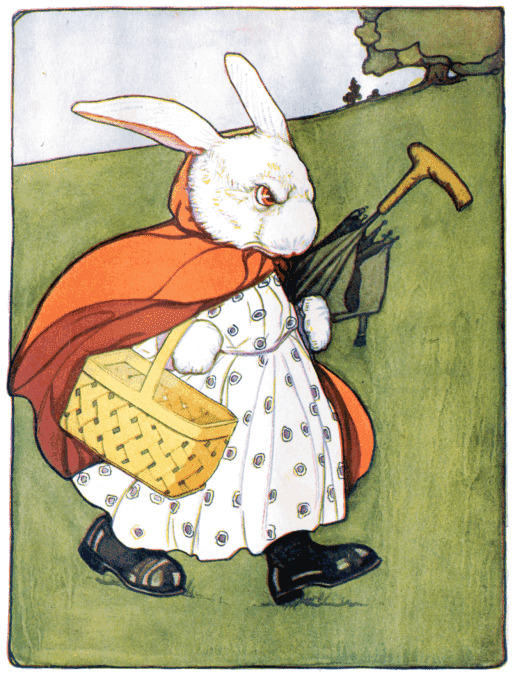 Lake Tahoe, though, was never home to Peter Rabbit. This afternoon, we visited Beatrix Potter’s home, Hill Top in Sawrey, near the village of Hawkshead. We rarely visit homes of writers, or famous people (too airless, dark and stuffy). Though Richard and I have been members of the National Trust (keeper of Ms. Potters home and thousands of other historic properties throughout the UK) for several years, we typically opt out of the house and castle tour in favour of walking the land and gardens. In this case, however, I was curious to see where the illustrator/author of one of my favourite early childhood books lived and worked. 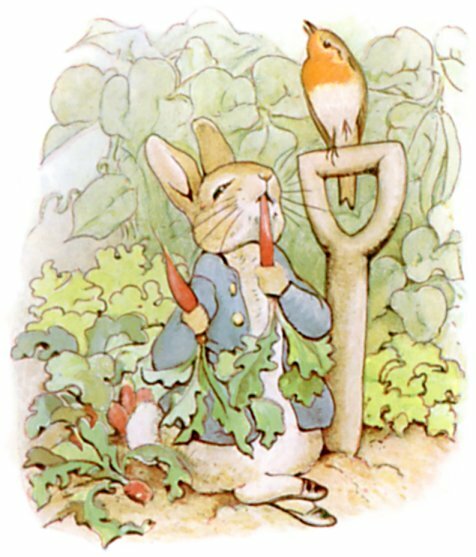 Beatrix Potter’s first and best known book, “The Tale of Peter Rabbit,” was originally self published in 1901, after being rejected by a half dozen publishing houses. 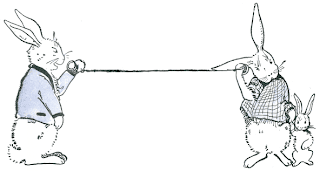 It proved so popular, the following year a London publisher printed and sold 50,000 copies of story. 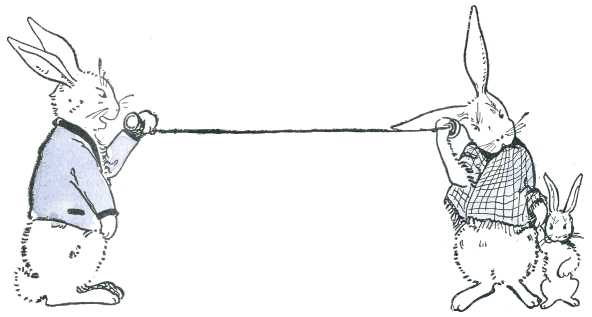 Beatrix went on to illustrate and write 22 more books. By 1905, she had established herself as a woman of independent means and bought Hill Top, the first of 15 farms she would acquire and bequeath to The National Trust, upon her passing aged 77. The house was much smaller than we had anticipated. 800 square feet, at the most, over two floors. And like most houses of this period, it was modest, dark and creaky, with dainty windows. There wasn’t much of a kitchen, with most of the food prepared at the black hearth, in the front room. I remember my mother’s wonderfully expressive reading of The Tale of Peter Rabbit, when I was about five years old. And here’s the peculiar thing, I secretly wanted Mr. McGregor to catch Peter and bring him home to his wife for a rabbit pie. I’ve no idea why I felt this way, as I was a bit of a naughty child myself. 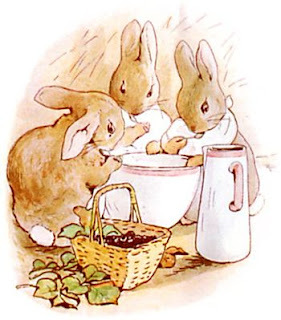 Maybe it’s because Peter’s sisters, Flopsy, Mopsy and Cottontail, and their mother were doing all the work, while the boy in the family frolicked and gorged himself on treats. In any case, I was disappointed to note that Ms. Potter’s garden looked nothing at all like the McGregors’ garden. 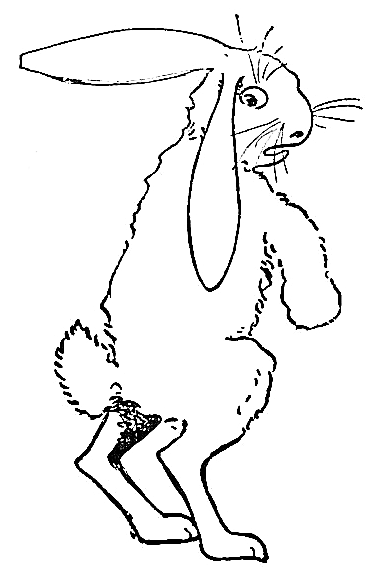 There was nary a carrot, or rabbit, in sight. I buy wild game from a local lady farmer, who sells her fresh meat at our farmers market. She also makes all sorts of game pies. Choose wild rabbit on the bone, either whole, or butchered. If you don’t have a local butcher, try farmers markets, farm shops, or online. Like all wild game and turkey, rabbit benefits from brining. This only takes minutes to prepare, but will tenderize the toughest meat. Give yourself 24 hours of brining before making the pie. Make the brining solution in whatever food safe container best accommodates the meat, fully covered in brine, in the fridge. I usually use a stainless steel stock pot, with lid, for the job. 1 cup coarse kosher salt. Note: Table salt is much saltier. If you use it, make sure it is free of iodine and use half the amount of kosher salt. In medium size pan, bring apple juice to boil. Remove from heat. Stir in salt. As salt dissolves, fill suitable brining container with cold water. Add the salted apple juice. Stir well. Add rabbit. Cover and refrigerate 24 hours. Remove rabbit from brine. Discard brine. 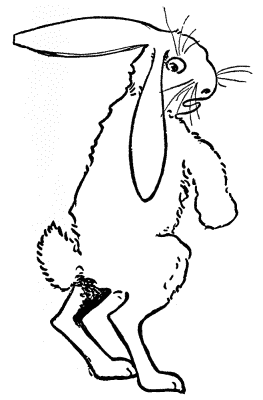 Rinse rabbit thoroughly under cold running water. Dry with paper towels and set aside. Wild Rabbit and mushrooms go together like Flopsy, Mopsy and Cottontail. Because wild rabbit doesn’t have much fat, lardons are traditionally added to add depth of flavour. When making pies, I usually buy quality, frozen pastry. If you prefer to make your own, I applaud you. Either way, you’ll want to prepare the pastry first, so when your pie is ready, all you have to do is pop on the pastry top, 20 minutes before baking ends. Prepare pastry. In my case, that’s a couple of hours of defrosting, while I get on with the making the rest of the pie. Soak dried mushrooms in 1-pint of freshly boiled water. In 4 quart, oven-proof casserole type pot (with lid), fry lardons over medium heat. While lardons are cooking, peel and thinly slice onion. Remove lardons from pot and set aside. Add olive oil to pot. Fry onion over medium heat, until golden brown (about 12 minutes). Sprinkle in flour. Stir well until blended into onions. Add lardons, apple cider, sage, bay leaves, pepper, and salt. Mix well. Bring to boil over medium heat. Add rabbit. Cover. Transfer rabbit to oven. Bake covered 60 minutes, turning meat once, mid-way through cooking. Remove rabbit from oven. Lift out of pot, onto large plate. When meat is cool enough to handle, remove bones, shred meat, return to pot. Blend well with onion and cider. Transfer to pie dish. Top with pastry. Bake 20 minutes, or until pastry top is golden brown. Instead of pastry, mix 4 cups bread crumbs with 2 garlic cloves and 100g soft butter. Spoon onto rabbit pie. Bake 20 minutes. Consider making wild mushroom gravy, mashed potatoes and roasted carrots to go with the pie. Best beverage is pressed apple juice and apple cider. 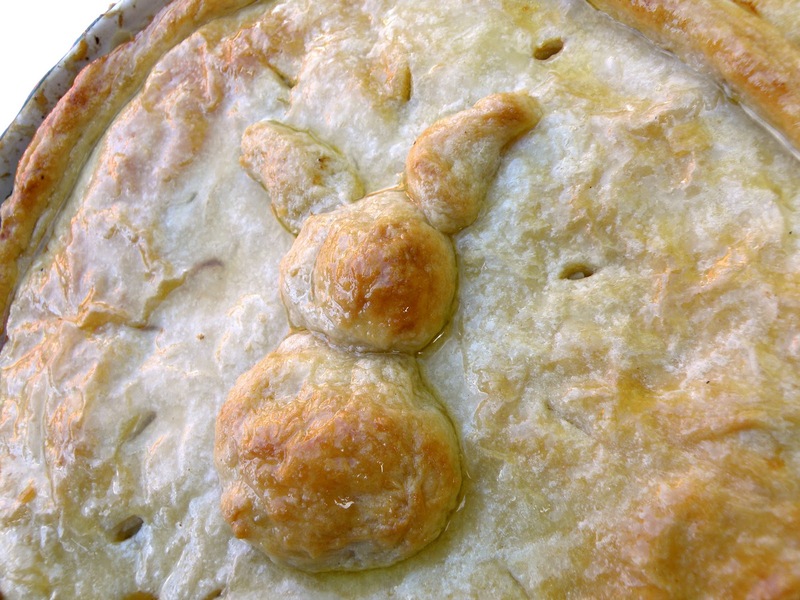 Wild rabbit pie recipe works equally well with most game. Try it with pheasant or turkey. We very much enjoyed the 2006 film, Miss Potter, with Rene Zellweger. 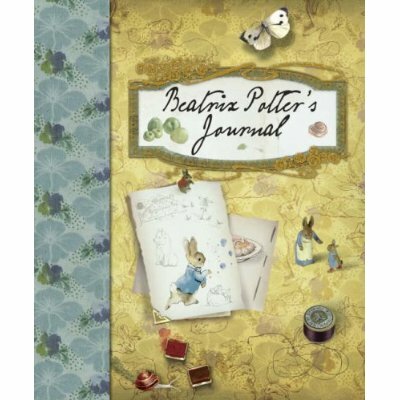 Keep your eye out for the lavishly illustrated, Beatrix Potter Journal, published by Warne in 2006. A visual picnic. 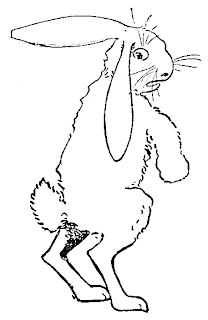 Victorian and Edwardian music are well suited for a meal of rabbit pie. There’s the waltz-heavy, Victorian Edwardian CD put out by Cavendish Music Library, or anything from Victorian romance music, to Parlour game and sing-along classics. 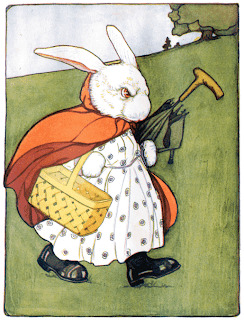 Illustrations by Beatrice Potter and Virginia Albert.